Tyler Gorman/Contributing Photographer The Undergraduate Anthropology Organization holds a discussion about appropriation of Native American cultures. In an effort to increase awareness and dialogue about cultural appropriation, the Undergraduate Anthropology Organization (UAO) held “Was your Halloween Costume Racist? : The Appropriation of Native American Culture” on Wednesday evening in the University Union. The event, held in honor of Native American History Month, focused on cultural appropriation in costumes, specifically toward Native Americans, with the wearing of headdresses and redskin costumes. Participants discussed why this appropriation is offensive and talked about appropriation in relation to music, fashion and food. For Mariya Ivanova, editor of the UAO and a junior majoring in anthropology, it is important to recognize that appropriation, especially at events like Coachella, is not acceptable. Ivanova said the only way to fight appropriation is to start a conversation. 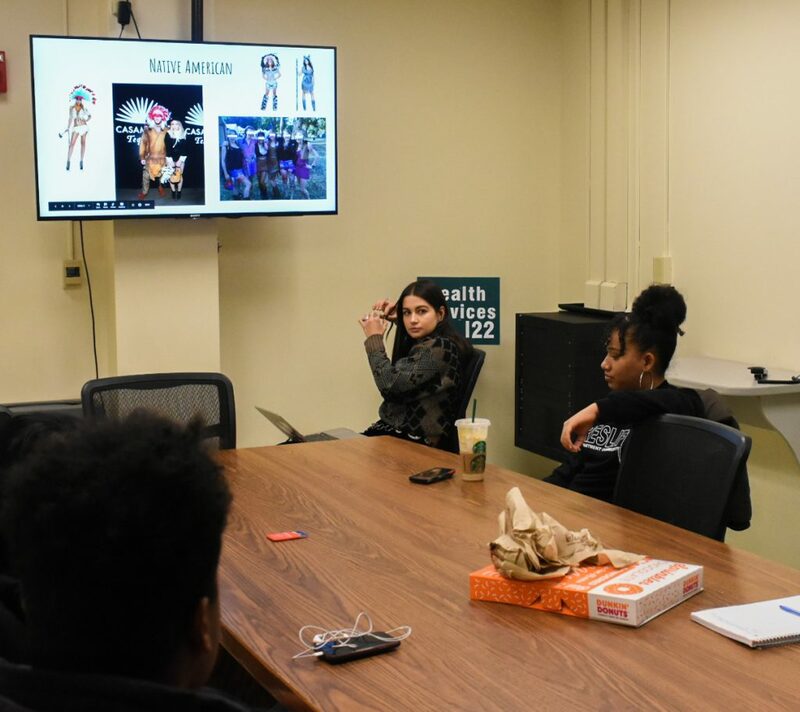 The UAO, a Student Association-chartered organization that hosts events on campus related to the anthropology major at Binghamton University, has recently begun hosting events that address sociocultural issues such as cultural appropriation. In the past, it has hosted events on language and dialect, and hopes to host an event on sexual assault awareness in the near future. Melina Valencia, UAO events coordinator and a junior majoring in anthropology, said anthropology relates to how people are perceived by the world, which makes cultural appropriation an interesting topic to tackle from an anthropological viewpoint. “Making a lot more events and allowing people a way to be perceived that isn’t overtaking someone’s culture is really important to me,” Valencia said. The UAO E-Board wrote that Native Americans have been oppressed for centuries, and the fact the University lies in an area once populated by Native Americans means students should be more aware of cultural biases. According to the e-board, although this Halloween at BU was more culturally sensitive than in the past, it still saw some inappropriate costumes during the holiday. Christian Tejera, a senior majoring in computer engineering, said appropriating is different from actually caring about the culture.